The Manchester Evening News reports that Manchester United are actively pursuing the signing of Belgium international, Toby Alderweireld from Premier League rivals, Tottenham. The 29-year-old is entering the final year of his contract with the north London giants and has refused all offers from the Lilywhites as he believes that he should be earning more than he currently takes home per week. Manchester United boss Jose Mourinho seems to have identified the centreback as one player to elevate his backline and turn his team to an almost impenetrable defence that conceded just 28 times last term. Alderweireld is keen to leave Spurs to join a club that can actually win the major trophies on offer and it is suggested that Spurs are holding out for £75m fee for any club that wants to sign him though United believe that £55m could get the deal done. 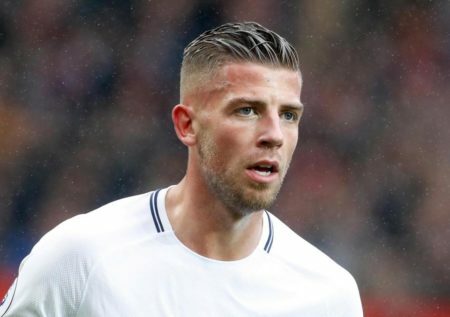 Sam Pliger, who is a former United magazine editor stated that United are getting closer to signing Alderweireld and that the deal could be done quicker than expected. Despite boasting one of the best defences in the Premier League, Jose Mourinho remains unconvinced with the likes of Chris Smalling and Phil Jones, who was particularly poor against Chelsea in the FA Cup Final. It is believed that United will push ahead to sign the former Atletico Madrid man to form a solid partnership with Eric Bailly. Since moving to the Premier League in 2014 initially with Southampton and latterly Tottenham, Alderweireld has become one of the best defenders in the division, racking up consistent displays for Pochettino’s men. If he joins United, he will add more solidity to a backline that has the excellent David De Gea in goal. Alderweireld has made 115 appearances for Spurs, scoring 6 goals in the process. He doesn’t want a club that can ‘actually win’. He wants a pay rise, pure and simple. If Man U want to pay Spurs the transfer fee and give him his pay rise then so be it but don;t make out that it’s about trophies. Let’s be clear: the league cup and Europa league are cups for losers. You don’t win major trophies by defeating the likes of Hull, Celts Vigo and Southampton. The FA Cup stopped being a real trophy about 15 years ago when every team that enters it from the top 2 divisions started routinely entering reserve teams in the competition. United play for two major trophies: the league and the champions league. There absolutely nowhere near winning either and haven’t been for 5 years. Signing an injury prone geriatric on stupid money is hardly going to help!